A few weeks ago, the US government agreed to give Israel $38 billion dollars, the largest military funding package the U.S. has given any nation. This $38 billion in military and other type of Aid will be used to imprison the Palestinians of Gaza, and continue Israel’s military occupation, and imposition of an apartheid state, upon the Palestinian people. Indeed, everything that comes into Gaza comes through Israeli hands. Gaza’s only airport was completely destroyed in 2002 by Israeli jets and ground forces. Egypt continues to be a part of this blockade as they have blocked Gaza’s southern border; and Egypt continues to receive USA military funding. Medical authorities have reported that the time for operations in Gaza now goes up to 2025 as so many are awaiting health care, and the increasing issues around food, water, sewage, electricity, all of these mounting problems have led the U.N. to declare in their latest Report, that by the year 2020 Gaza will be uninhabitable. What hope is there for the Palestinians of Gaza, the vast majority of whom are young people? The Women’s Boat to Gaza set sail from the Spanish Port city of Barcelona (Barcelona is twinned with Gaza) in mid- September 2016. The three legs of the trip were 1715 miles from Barcelona to Ajaccio, Corsica, France and then down to Messina in Sicily, Italy. It was hoped to have two boats but when one developed engine trouble in Barcelona, the other 50’ sailing boat, Zaytouna-Oliva, continued alone. At all Ports the women were greeted and hosted by mayors, officials, and supporters of the Free Palestine Movement. Over 40 women from around the world flew to Messina in hopes of being able to sail to Gaza. I joined the boat in Messina, and was grateful to be chosen as one of the 13 women from thirteen countries, being finally chosen to sail to Gaza. It was sad for those of us sailing to leave behind so many wonderful women due to not enough boats to sail, but it is hoped the Palestinian Coalition will be able to get more sailings to accommodate those wishing to go on a future occasion. The 13 chosen participants included Ann Wright, (boat leader) the captain and two crew, two Al Jazeera journalists, and women from USA, Ireland, Russia, UK, Spain, New Zealand, Norway, Sweden/Chile, Malaysia, South Africa, Australia, and Algeria. The third leg of the journey from Messina to Gaza was almost 1000 miles and a nine-day journey. On 29th September 2016, we set sail from Messina, Sicily, after a wonderful reception from the mayor, the Muslim community, and many Palestinian friends in Messina. The first few days sailing the weather was rough and many of us were seasick, but several days into the journey we had got our sea-legs and busied ourselves helping with the tasks to be done such as cooking, reporting, night watches with the crew, etc. We shared our stories and held nonviolence training. It was a wonderful experience getting to know the women whose courage was inspiring. Their love for the Palestinian people and their freedom was very deep. Unfortunately, some 400 miles from Messina, with some 600 miles to go, we had problems with the boats rigging. An appeal to friends in Crete resulted in a boatful of people coming out to meet us, bringing many gifts of food, and four men to fix the rigging! This was for me one of the most moving experiences of the journey, and it proved yet again, the magnificence of the human spirit. Around 20 men and women answered our call for help and came to our aid, and all for the people of Gaza. After the men fixed our boat rigging, we passed greetings to our rescuers from Crete and sailed in a happy and hope filled mood towards Gaza. However, we kept sailing towards Gaza. We saw several Navy military ships on the horizon. At 6 p.m., a Zodiac boat came alongside our boat. There were 30 Israeli sailors including Israeli women sailors who were the first to come on board our boat. They were not in combat gear. They wore baseball caps, and long sleeved jerseys. In 2010, I had been on the Rachel Corrie Irish/Malaysian boat, which was part of the Freedom Flotilla and when we were boarded by Israeli sailors, they were in combat gear, with rifles, and sniffer dogs, and we were handcuffed and forcibly taken to Israel. I was surprised when this different approach was used to confiscate our boat ,the Zaytouna. In 2010, on the Mavi Marmara, the Israelis murdered nine people, and subsequently a 10th person died as 50 people were wounded. Therefore, the treatment of our women’s boat to Gaza participants was very different from what happened on previous ones where I had travelled. 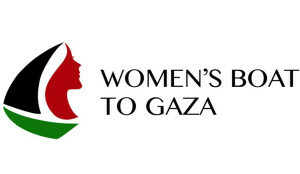 All the women were deeply saddened as we knew many people in Gaza were preparing for our visit, and yet again Israel was denying our entry into Gaza. So as we watched the coastline of Gaza in complete darkness and then the coastline of Israel fully lit up against the night sky, we were again witnessing the injustice and unfairness of the Israeli policies against the Palestinians. With this experience, many of us committed in our hearts to continue our support for the Palestinian people’s ongoing work to break the blockade and end the occupation. We also saw just off the coast of Gaza two huge gas rigs fully lit up and whose gas is piped to Israel. Yet Gaza has only a few hours of light, as Israeli bombings have destroyed most of its electricity and sewage infrastructures. When we reached Ashdod, Israel, after six hours sailing, we were processed by Israeli security and searched, taken to Prison and released two days later. All the women on board the Zaytouna, now have a ten-year deportation order. As this is my 4th time being given a 10-year deportation order, it will be 40 years before I can return to Israel or get into Palestine. This thought reminds me that there are over 7 million Palestinian people who cannot return to their country, and this is why it is so important to campaign for the right to return for the Palestinian people. I would like to thank the Freedom Flotilla Coalition who gave us the opportunity to participate on the journey to Gaza. Their work of joining in solidarity with the people of Gaza is so important and I thank them for all they do. To the Palestinian people of Gaza, please keep your hopes high and believe that freedom and peace will come. Thank you for your perseverance and ongoing inspiration to us all.